Fragrant. 5 to 6+ Feet. July flowering. 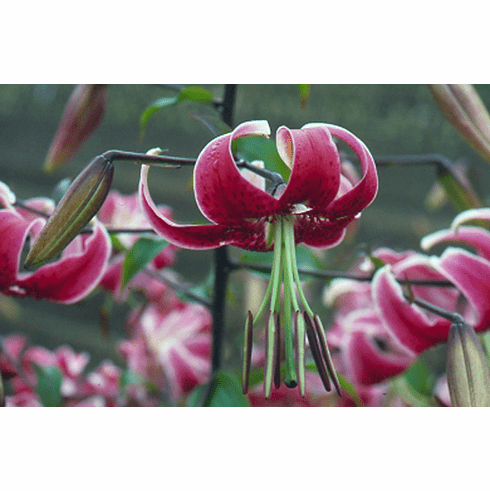 Bred in Bellingham, Washington by the late LeVern Friemann this strong-growing Tetraploid Orienpet lily has dark rosy-red flowers with creamy-yellow margins that lighten as the bloom ages, a small amount of papillae, indistinct spots, and light pink, green and brown tints on the petal reverse. This is the original 'Scheherazade' (Triploid Thurderbold x Tetraploid Black Beauty) as selected from LeVern's garden over two decades ago and referred to in the book 'Lilies' by his friend Edward McRae. It is not the pseudo 'Scheherazade' offered by some Dutch catalog companies which go so far as to claim it is a "rare re-bloomer". Well grown stems of 'Scheherazade' will produce both secondary and tertiary buds which extend the bloom for more than a month, but like all lilies, once the bloom is done, it is done. Neither 'Scheherazade' nor any other true lily produces a second or third bloom such as is found in Daylilies (Hemerocallis). Light fragrance. 5 to 6+ Feet. Late July / Early August Flowering. Fragrant. Editorial Note: Promoted as having flowers "10 inches wide", in one garden magazine, we have never seen this. In light shade, up to 7.5 inches, full sun, they are about 6.5 to 6.75 inches. On 8/5/09 as this was being written, all of the Friemann 'Black Beauty' Hybrids are in flower around our home. Several exceptional "Best in Show" stems of 'Scheherazade' are sporting flowers measuring 6 7/8 inches. Along with promoted as "sometimes blooming twice in the same season" makes us wonder just how gullible some catalog companies think people are. 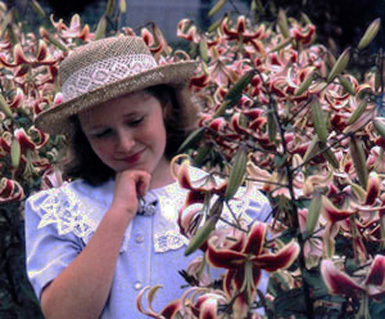 We list this information only as a FYI for those who care (most gardeners don't), but B & D Lilies is the oldest lily specialty nursery in America, we knew and worked with the lily breeding pioneers, and we would like to see the accurate reporting of history and breeding information, not someone's revision in order to market bulbs they simply purchase for resale. Photo is of our daughter Anne Marie admiring our first commercial crop of 'Scheherazade', produced from bulblets dug from LeVern's garden in 1994 and shown here in our Port Townsend field in the summer of 1998. This was also our spring 1999 catalog cover. LeVern selected and shared 6 other Black Beauty hybrids some of which have also entered the market place as 'Scheherazade' which they are not.